The number of foreign guests at the Port of Esbjerg has multiplied many times in recent years, and guests are now more often from countries such as the USA, China and Korea rather than from Europe. Last year alone there were 150 visits. Joshua Nelson and Ed Backlund sit in a port car gazing out of the window. They have come all the way from New York just to visit the Port of Esbjerg and are having a tour. Silence fills the car and Joshua takes a photo with his phone out of the window. "Wow," he says. A second later, Ed says the same. "Wow." They say they have never seen anything like it. They are both consultants from the global consulting company Hatch, which provides advice in fields such as energy, infrastructure and ports. The two men carefully researched ports all over the world and decided to visit Esbjerg because "no other ports have a more diverse profile than Esbjerg," as Joshua Nelson says. "And then there's no choice but to 'get your boots on the ground'," he says. He studied the Port of Esbjerg thoroughly on Google Maps but knew very well that this would not suffice. In the USA, offshore wind power is exploding. 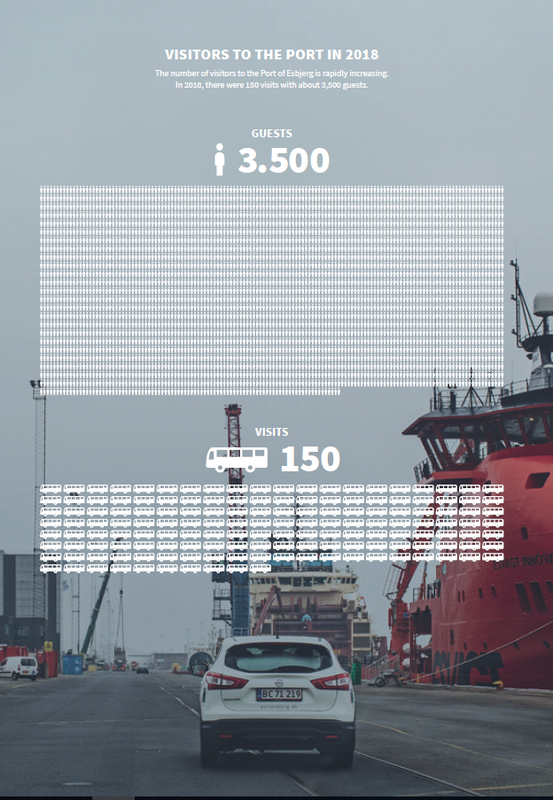 Although the guests at the Port of Esbjerg on this January day come from a country where everything is normally bigger, that does not apply to offshore wind. In the USA, to date there is only one active offshore wind farm but 16 others are on the drawing board. In December 2018, three areas were allocated in Eastern USA, each covering 130,000 acres, which corresponds with the area of Falster. Joshua Nelson and Ed Backlund also feel the rising interest for offshore wind power in the USA. That is why they are sitting in the port vehicle looking out at 80 rotor blades from Siemens Gamesa lined up on the quay. American states and companies and even the Port of New York are interested in offshore projects and contact Hatch. "And that's why we base our advice on seeing the best there is," says Ed Backlund without the hint of a smile. When the tour is over, the two Americans are treated to traditional Danish open sandwiches. "We certainly got what we came for," says Joshua Nelson, nodding goodbye. The 40 hours in Denmark were a good investment. Chief Commercial Officer at the Port of Esbjerg Jesper Bank is one of the hosts for the many tours of the port. He is shown here with New Yorkers Joshua Nelson and Ed Backlund from the consulting company Hatch. The visitors are typically from other ports, organisations, politicians or companies. "On an annual basis, we give about 1,000 commercial guests tours of the port. Add to this schools, universities, political organisations and EU officials. And then we have the official open tours for neighbours and citizens," says Jesper Bank. Foreign visits to the Port of Esbjerg began booming a good five years ago. According to CCO Jesper Bank, it began with delegations from the North Sea countries, Germany, the UK, Netherlands and Belgium. Then three or four years ago, visitors from more distant destinations began showing up. "After that came China, Korea, Taiwan and Japan, which are kind of 'emerging markets' within offshore wind power," he explains. Over the past couple of years, visitors from the USA have been arriving. Mainly visitors from the East Coast states.